This has been unfolded and approved by the Board of New Zealand Bridge at its last Board Meeting. The aims are to get more young people playing bridge, in schools, at home, on-line, in clubs…everywhere. They may play a little now and put away their knowledge for a few years. We hope many of them will just keep on playing but there are other priorities for many in one’s 20’ and 30’s. We want to show that Bridge is truly a game for all ages. Jan is starting to become quite well-known in the Auckland-Northland bridge scene. She is supporting clubs in her role as the Auckland-Northland Regional Bridge Mate. She is now in charge of the Auckland-Northland website. Her latest appointment is to work one day per week on Youth Bridge. She has knowledge and an affinity with young people stemming from a career “in a previous life” back in England. She hopes to bring such knowledge and enthusiasm to her new role. The role will not overlap the work Sam Coutts is doing with our international Youth Squad. That remains separate though we do hope to unearth players who will join that squad. Although the plan has only just been approved, Jan has spent several months gathering information on what currently exists as far young people’s bridge in this country. Indeed, the information gathering represented Year 1 of that plan. Establish a link with each region- a person in each region to be the focal point for Youth. Establish a network of contacts of those currently working with young players to see how they can be assisted: support materials etc. Create a leaflet, well really 4 leaflets for promoting bridge in schools. Each leaflet will address a different group: the schools themselves, parents, bridge clubs and the young people themselves. Establish an Award System for young bridge players. The players will receive certificates for each level of achievement. Create a means for young bridge players to connect with each other, to bring young players together, both face-to-face and through the internet. Create and maintain a list of those involved with young people’s bridge in this country. Continue existing Youth Activities like inter-school competition and the National Youth Bridge Weekend and involving schools in these activities. Establish a Holiday Bridge program to run at some bridge clubs in the Christmas 2019 holidays. Improve the information which is available for young players on the New Zealand Bridge website. In the above, Jan and I will work together to get more young players trying and playing the game. Have you ever seen a room full of young chess players? 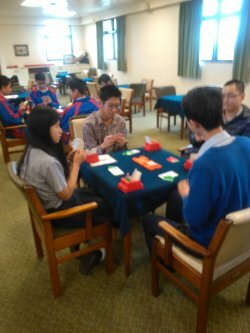 We want to create similar rooms full of young bridge players.